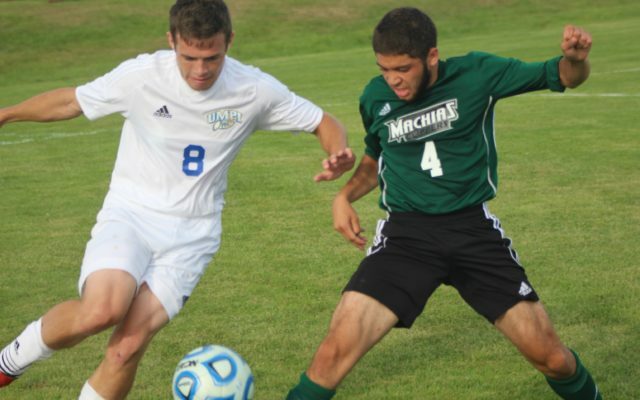 PRESQUE ISLE, Maine — The Owl soccer, volleyball and cross country teams had busy weekends as they continued their early-season schedules. The Owls split a pair of soccer matches, losing to Fisher College Saturday, 3-1, before bouncing back Sunday to stop Hampshire College, 4-1. Andre Rossignol continued his high-scoring ways by tallying the lone goal against Fisher and picking up a hat trick in the win over Hampshire. Rossignol now has seven goals in UMPI’s last three contests. Coach Alan Gordon’s UMPI squad carries a 3-2 record into the next match on Saturday against Northern Vermont-Johnson. The Owls then travel to Unity for another match Sunday. The volleyball team lost all four of its matches against Brandeis and Gordon College Friday and UMass-Boston and Bowdoin Saturday. All four were played in Massachusetts and dropped the team’s record to 2-4. Sophomore Miranda Washinawatock was a bright spot by leading the Owls in kills in all four matches, collecting 23. Devine Hoskie had a combined 16 digs in Saturday’s matches, while Laura Aroz had 35 assists on the weekend. The Owls host Fisher College and the University of Maine at Machias Sunday, with matches at 10 a.m., noon and 2 p.m. Freshman Valentine Degiovanni ran the five-kilometer Belfast course in 20:54.7 to take first at the Mariner Invitational cross country meet Saturday, hosted by Maine Maritime Academy. She helped the Owls to third place out of five teams. Irina Norkin took 10th in 22:48.3 and Emilia Churchill and Kendra Silvers were 16th and 17th overall, respectively, for UMPI. The men’s team was led by Nino Manzella, who was 15th in 18:58.3. Kyle Davis of the Owls was 19th in 19:28, while Andrew Hunt and Hunter Dionne came in third and fourth for UMPI and made the top 25. The Owls took fifth place out of seven teams. The teams next compete in Wenham, Massachusetts, Sept. 22 in a meet hosted by Gordon College.